Tetracycline staining: These drugs cross the placenta and can have toxic effects on the developing fetus, and are therefore contraindicated during pregnancy. Toxic effects on the developing fetus include dental discoloration, enamel hypoplasia, and a 40% depression of bone growth. Tetracycline can cause discoloration and enamel hypoplasia of both the primary and permanent dentitions if administered during the period of tooth development. The major factors impacting the amount of tetracycline deposition are dosage, duration of treatment, stage of tooth mineralization, and activity of the mineralization process. The discoloration, which is permanent, varies from yellow or gray to brown depending on the dose or the type of drug received in relation to body weight. After tooth eruption and exposure to light, the fluorescent yellow discoloration gradually changes over a period of months to years to a non fluorescent brown color. The labial surfaces of yellow-stained anterior teeth will darken in time while the palatal surfaces and buccal surfaces of posterior teeth will remain yellow. The calcification of deciduous teeth begins at approximately the end of the fourth month of gestation and ends at approximately 11-14 months of age. Permanent teeth begin calcifying after birth and are not affected by exposure to the tetracycline during the prenatal period. The calcification of permanent teeth is completed at 7-8 years of age with the exception of the third molar (“wisdom” teeth). Therefore, the administration of tetracycline to pregnant women must be avoided during the 2nd or 3rd trimester of gestation and to children up to 8 years of age because it may result in discoloration and enamel hypoplasia. The association between staining and enamel hypoplasia as a result of high doses of tetracycline during calcification is possible. Minocycline staining is characterized by a blue-gray to gray hue darkening of the crowns and black or green darkening of the roots of erupted teeth. Minocycline differs from other tetracycline in that it is well absorbed from the gastro-intestinal tract and chelates with iron to form insoluble complexes, and this may provoke the tooth staining. ► See also: ORAL MEDICINE : What is Oral Mucositis? Miscellaneous: Discoloration is almost impossible to eliminate if caused by silver nitrate or strongly colored iodine solutions in the root canal. Root canal sealers containing iodoform or precipitated silver can also cause discoloration when contracting pulp chamber dentin. Silver points extending into the crown and corroding because of leakage will cause staining. Diamine silver fluoride caused tooth discoloration when used for treatment of dentin hypersensitivity. Fluorosis: Dental fluorosis is a condition of enamel hypo mineralization because of the effects of excessive fluoride on ameloblasts during enamel formation. The critical period for clinically significant dental fluorosis in human maxillary central incisors is during the age range of 15 to 30 months. 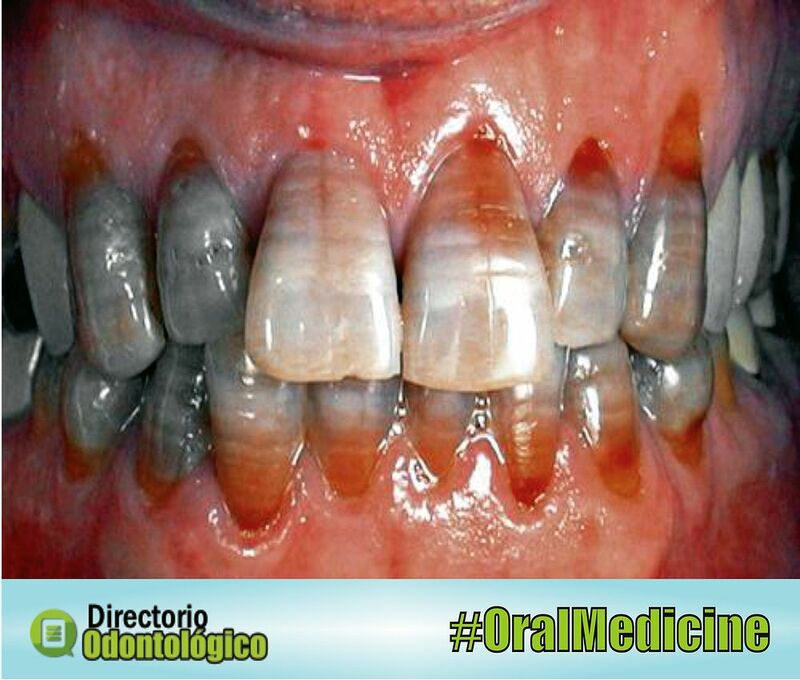 The main consequence of dental fluorosis is compromised esthetics. In its mildest forms, enamel fluorosis appears as loss of translucency at the tip of the summit of the cups of the premolars, molars, or incisal border of the anterior teeth, poorly demarcated opacities, faint white flecks, spots, or striations. Enamel hypoplasia: Discoloration (white, yellow, or brown) of enamel and enamel hypoplasia are the most common and milder states of traumatic dental injury. Hypoplasia is characterized by reduced enamel thickness of varying degrees, as well as pits and other irregularities, and although the hardness and transparency of the enamel remain intact, the extent of irregularities varied from tiny spots to large areas, 18 this condition may be localized or generalized. The effect is directly related to the degree of systemic upset. There may be pitting or grooving which predisposes to extrinsic staining of the enamel in the region of tooth disturbed, often then becoming internalized. Pulpal Pathology: Bacterial, mechanical or chemical irritation to the pulp may result in tissue necrosis and the release of disintegration by-products that might penetrate the tubules and discolor the surrounding dentin. Acute trauma to an erupted tooth can cause intrapulpal hemorrhage giving it a reddish tinge. This discoloration can change to gray-brown in a matter of days as the pulp becomes necrotic. The translucency of the crown gradually decreases, giving rise to yellowish or yellowish brown discoloration. Root resorption: Root resorption is often clinically asymptomatic; however, occasionally the initial presenting feature is a pink appearance at the amelo-cemental junction. Dental materials: dental restorations most commonly cause intrinsic discoloration. Amalgam restorations can generate corrosion products, leaving a blue-gray color in the tooth, especially in large cavity preparations with undermined enamel known as amalgam blue. Open margins around composite or glass ionomer restoration may allow chemicals to enter between the restoration and the tooth structure and discolor the underlying dentine. Ageing: The natural laying down of secondary dentine affects the light-transmitting properties of teeth resulting in a gradual darkening of teeth with age.